Austin Air is one of the most trusted manufacturers of air purifiers. Their purifiers are designed best for allergy sufferers and are constantly recommended by top allergists. They were also ranked first by the US Army in an independent test. Austin Air was founded by Richard Taylor. When his wife, Joyce, had trouble breathing for no reason, Richard wanted to find a solution. Doctor visits and medication and diet changes did not solve the problem, and it was apparent that the environment was causing these issues. Richard designed an air purifier with True medical HEPA surrounded with activated Carbon. Within a week, Joyce was able to breathe easily and sleep comfortably. Our indoor air is up to 5 times more polluted than the air outside. This is caused by anything from household plants to ink cartridges. All air purifiers are produced with solid steel construction and non-toxic powder coated paint which promotes strength, reliability and longevity. For a filter to be effective, gases and sub-micron particles must be removed from the air. 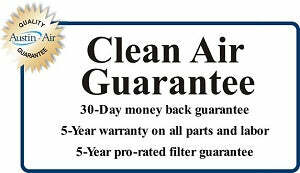 You will find True Medical Grade HEPA as well as Activated Carbon in every Austin Air filter. The True HEPA filter was developed by the Atomic Energy Commission in order to protect our respiratory system from radioactive dust particles. Austin Air takes this one step further, incorporating True Medical Grade HEPA with 99.97% efficiency down to 0.3 microns and 95% efficiency down to 0.1 microns. This HEPA is the most efficient particulate filtering medium that we have available today. Activated Carbon is used to remove Volatile Organic Compounds (VOCs); noxious gases and chemicals. These are especially useful for people with Multiple Chemical Sensitivity (MCS).